Brighton & Hove LRC is stepping-up its support for local green keepers currently fighting the imposition of a 20% pay cut (£4,000 on average) and 28% staff cuts by private contractor Mytime Active. B&H LRC has drafted a resolution to be taken to local Labour Parties and other organisations, as shown below. We encourage all our supporters to propose this resolution, suitably amended as required for their organisation and/or area. 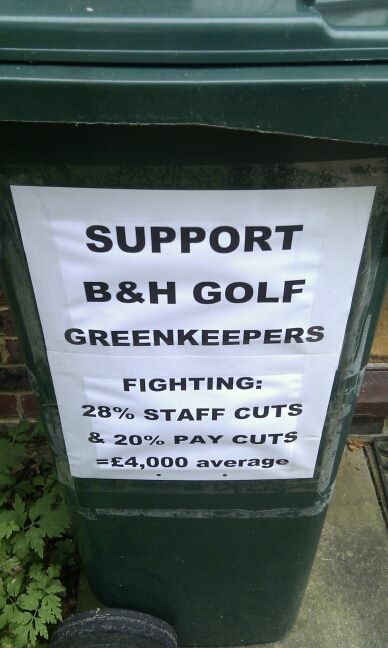 The green keepers will appreciate your solidarity even if you are outside of Brighton & Hove. A solidarity message on your bin is also an option. Support our green keepers, who a cash-rich company appears to be trying to penalise for its own failings, and oppose any privatisation of public sports facilities. This [Labour Party/other organisation] recognises the value that being able to participate in sporting activities has to the health and well-being of all, including residents of Brighton & Hove [and…]. We deplore all increases in the price of public participation at all sports facilities owned and/or controlled by Brighton & Hove City Council [and…], above any necessary inflation-linked price rises. We also deplore any attempt by the Council to privatise, sell or relinquish control of any of its sports facilities. We call upon the Council to take back under its direct control all such facilities where management and/or operations have already been outsourced to private contractors. In particular we call upon Brighton & Hove City Council to bring back in-house the management of the Hollingbury Park and Waterhall Golf Courses, so that these facilities are once more under day-to-day council management and do not have their operations outsourced to Mytime Active. We support the green keepers in their dispute against Mytime Active’s plan to enforce 20% wage cuts (on average £4,000) and 28% staff cuts to green keepers working at Hollingbury Park and Waterhall Golf Courses. We encourage all members of Brighton, Hove and District Labour Party to do likewise, especially members of the Labour and Co-operative Group on Brighton & Hove City Council and members of these two golf clubs. We urge Brighton & Hove City Council to intervene immediately in support of the green keepers and to publicly express its disapproval of Mytime Active’s intended wage and staff cuts to the green keepers.